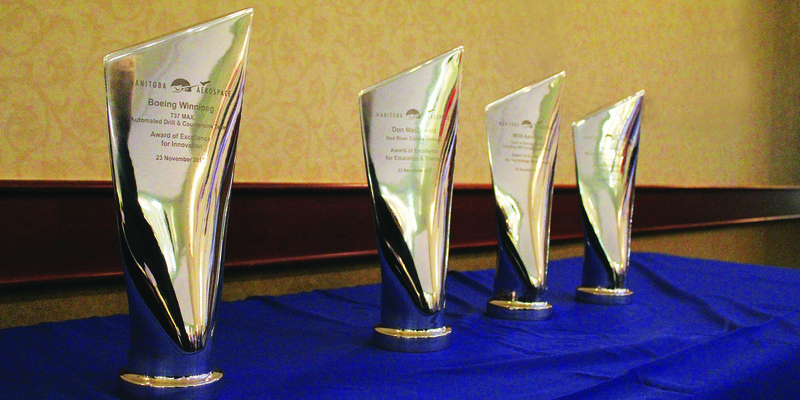 On November 22, Manitoba Aerospace held its 17th annual Aerospace All-Stars Awards of Excellence in Winnipeg. The event recognizes partners or individuals involved in or with the aerospace and defence industry, who have demonstrated excellence in a variety of areas, from leadership to business growth. Award winners are nominated by their industry peers. Presented to the Canadian Composites Manufacturing Research and Development Team – Knife Edged Fairing Composite Technology Demonstrator. Team members include: Boeing Canada – Winnipeg, Convergent Technologies, Magellan Aerospace, ASCO, PCM, AVCORP, National Research Council, Red River College, Composites Research Network – University of British Columbia, and the Composites Innovation Centre. Presented to Greg Link with the Technical Vocational High School (also known as Tec Voc). Presented to Jim Prendergast of the National Research Council – Industrial Research Assistance Program. Presented to Kim Westenskow, managing director with Boeing Canada Operations Ltd.
“The annual All-Stars Dinner is an ideal forum for recognizing excellence in our aerospace community,” says Manitoba Aerospace Chair Ron Drepaul. “The dinner is also a major fundraiser for the Manitoba Aerospace Student Endowment Fund. Through the generous support of individuals, companies, and organizations over the years past, this fund has raised over $305,000, and has helped 107 deserving students. Manitoba’s state-of-the-art aerospace and defence industry is the largest in Western Canada, and is the third largest aerospace hub in the country, producing and selling more than $2.1 billion dollars of products and services annually. Aerospace is one of the province’s premier sectors, directly employing more than 5,000 highly skilled Manitobans. Manitoba Aerospace is a not-for-profit sector association that works to connect the local aerospace industry to national and international markets, and also aims to develop a world-class workforce to meet industry’s needs through partnerships with Manitoba educational institutions and other key stakeholders.